Art takes the worry and fuss out of cooking whole salmon with this easy bake recipe (thank you, Art!). “What the heck is ‘Manomim’?” you ask? That’s Ojibway for wild rice. Art cooks it up with some hazelnuts, cranberries and Muskee?? Tea to give the rice a smoky, tart crunch and pinch of Boreal flavour to make it truly Indigenous. Note: to cut down on cooking time for the manomin, which takes twice as long as brown rice and uses more liquid, soak the rice in 3 cups of water or natural cranberry juice overnight. You can also stir in 1 or 2 tsp canola oil to the soaking mixture to prevent rice from sticking. • To begin the wild rice, crush up the hazelnuts and heat up in a skillet until brown and beginning to smoke then set aside. This should only take a minute if the skillet is preheated. • Place the rice soaked in berry juice in a pot over high heat to begin boiling and add the dried cranberries, hazelnuts, a pinch of sea salt and a small handful of muskeg tea leaves (labrador tea). Place lid on rice pot, bring to a boil and give the mixture a good stir before placing on a tight lid and turning the burner heat down to low. • While the manomin is cooking prepare the salmon by spreading it open and adding inside the body cavity salt, pepper, butter, sliced lemons and chopped onion until the fish is fully stuffed. • Place salmon on foil and score diagonal slits on both sides of the fish then brush on a mixture of oyster sauce, liquid smoke and dark brown sugar. Maple syrup also makes a nice glaze. Brush the sauce liberally on to both sides of the fish. • Wrap the salmon tightly in the foil using a rolling technique to keep the stuffing from falling out of the fish cavity, place on baking sheet and place in the oven. Bake for 50-60 mins depending on size of fish. 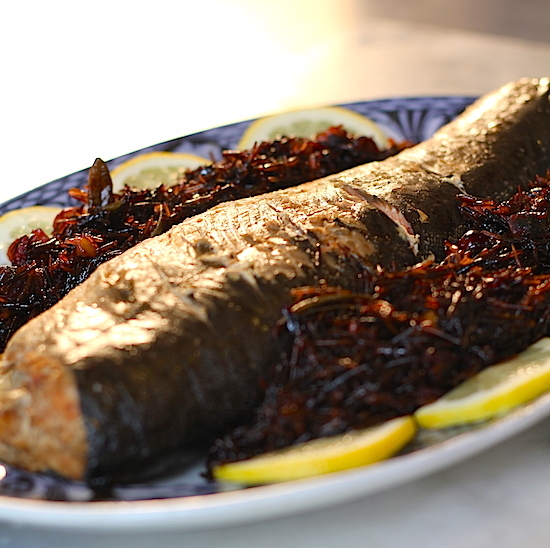 • Test the salmon and rice for doneness and serve with wedges of lemon or some other enhancement. The salmon test is using tine of a fork to see if skin scrapes off easily. The manomin is done when the grains have been split open. The pot of rice should almost triple in size. A good cook always aims to have all dishes finish cooking at the same time. If you consistently fail to do this when cooking meals with more than one course, you can’t call yourself a good cook yet. Don’t worry you’ll get there.